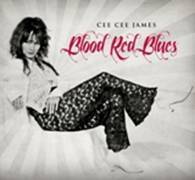 ST. LOUIS , MO – Blues-rock singer Cee Cee James announces a July 17 release date for her new album, Blood Red Blues, produced by Grammy-winner Jim Gaines, on July 17. Blood Red Blues will be released on her own imprint, FWG Records, with international distribution by Burnside Distribution. Blood Red Blues is the fourth CD from the St. Louis-based singer, whose powerfully soulful vocals have already created a lasting impression on audiences and critics alike all over the world. Producer/engineer/mixer Jim Gaines (Stevie Ray Vaughan, Santana, Luther Allison), who tracked the sessions at his Bessie Blue Studio in West Tennessee, perfectly captures all the exciting elements of Cee Cee’s vocal style on the new album, creating a sound that is both vulnerable and passionate, igniting the songs with a burning, sensual yearning that drives home the dozen all-original songs. Backing Cee Cee on Blood Red Blues are Rob “Slideboy” Andrews on rhythm and slide guitar, Rocky Athas on lead guitar, Chris Leighton on drums, Dan Mohler on bass and Susan Jillian on keyboards, along with vocal backing from Stanley Crouse, Vicki Atkins, Danunielle “Pie” Hill and Kimberlie Helton. Cee Cee’s blistering vocals tell the truth of the powerful messages in her songs, born and bred from a lifetime of heartache and loss, but delivered with a message of hope, understanding and the healing power of love. The hallmark off her career has been her intense live performances, as anyone who’s seen her can attest. Blood Red Blues distills that energy and transmits it through the recording process into something that is valid and compelling. Cee Cee James was originally based on the West Coast. Her first album, a pop/funk CD, garnered the Los Angeles Independent Artist of the Year Award; and a track off that album was honored as one of the top 10 in the John Lennon Songwriting Competition, before she directed all her talent and energy to the blues. Her second CD,Low Down Where the Snakes Crawl,” was released in 2008 and gained worldwide distribution, as well as critical press and radio attention. By that time, she had re-located to the Pacific Northwest and in 2009 she won the Klamath Falls, Oregon Blues Challenge & went on to compete in the 2010 IBC finals in Memphis, where esteemed writer/editor Don Wilcock called her” the most exciting and original act at this year’s IBC.” Her last CD, Seriously Raw – Live at Sunbanks,” drew more extensive radio airplay and rave reviews, also bringing Cee Cee the “Best Blues Songwriter Award” and a nomination for “Best Blues Vocalist” from the Washington Blues Society in 2010. Cee Cee James just returned from a tour of Europe that included shows in the recently earthquake-ravaged areas of Italy , and will return to that continent in October with a Scandinavian tour. She’s also been tapped to star in a supporting role in the upcoming film, We Be Kings, which also features such other blues stars as Magic Slim and Grana Louise, and features Slim’s band, The Teardrops. For more information, visit www.ceeceejames.com.